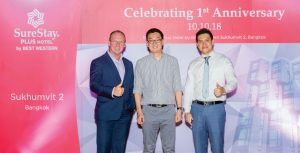 Bangkok (Thailand) – November 1, 2018 – SureStay Plus Hotel by Best Western Sukhumvit 2 recently held a rooftop party in Bangkok to celebrate its first anniversary. The hotel opened in October 2017 to become Best Western Hotels & Resorts’ first SureStay hotel in Asia. The high-flying event gathered Best Western’s executive team and key industry partners to the hotel’s stunning rooftop, overlooking the Bangkok skyline. Guests, including leading travel agencies, corporate partners and members of the media, were able to enjoy drinks, snacks and networking in a stylish and social ambience, whilst soaking up panoramic views from the impressive top-floor pool deck and bar. “SureStay Plus Hotel by Best Western Sukhumvit 2 has become hugely popular with visitors to Bangkok since it opened its doors late last year. This is a fantastic new hotel that delivers world-class accommodation and amenities at an exceptionally reasonable price point. Our anniversary party was the perfect way to say ‘thank you’ to all our partners for contributing to the hotel’s success,” commented Olivier Berrivin, Best Western Hotels & Resorts’ Managing Director of International Operations – Asia. SureStay Hotel Group® was first introduced by Best Western in late 2016, opening up new opportunities in the large yet relatively untapped premium economy and lower-midscale sectors. SureStay Plus Hotel by Best Western Sukhumvit 2 elevates this unique concept with 85 contemporary rooms and a series of premium facilities, including the spectacular rooftop pool and bar. Best Western will open two more SureStay hotels in Asia in the coming years, including the 108-room SureStay Plus Hotel by Best Western Shin Osaka and 68-room SureStay Hotel by Best Western Vientiane.